And yes, your question about "foil-out's"... I agree with what bryn said. Every sentence, well written and explained. He's very accurate as far I'm concerned. And what grant said too. My experience, and stuff I've learned from other's... they nailed the experience, exactly !!! 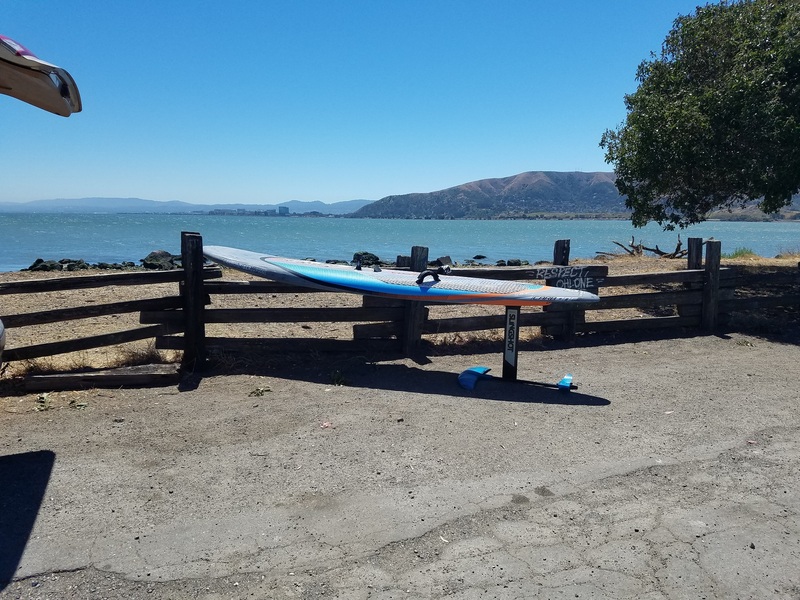 And the part bryn wrote about longer boards, making foil outs and touch n go's easier... cause of the lesser angle, when the bow hits the water, "exactly". The only thing I'd add, is the advantage of having a good rockered bow. From what we're saying... you can see how a longer, wider, rockered, bow... will save hard, nose-diving crashes... compared to a short and flat-ish nose. Anyway, at 170 lbs. with your skill and experience... you will be fine learning to windfoil on the Hover. I would just say, that if you have access to a Go board, then it wouldn't hurt to get the basics down on the Go. And then, later, switch to the Hover. Or play with both, and post your experiences... that'll be helpful to us all. Like you said, there is a lot of diverse info out there. But the more data we get, we'll become more accurate in what works, for who. When you jump regular gear, you're hanging your weight off of the sail. Totally different scenario. Different foils have different responses to foiling out, too- Some of them will gurgle and give you a bit of a head's up, and actually "re-grab" traction really quickly if they do let loose. In my experience, these tend to the be the thinner wings. Other foils will let loose with no warning when you simply get too close to the surface- you don't even have to break out of the water for them to lose lift. These tend to be the thicker ones, in my experience, but as with all things there are certainly going to be exceptions to the rule. All that said, foiling out and falling every now and then is all part of the fun, in my opinion. When's the last time you crashed uncontrollably on a ten knot day on regular windsurfing gear? It just adds a bit of the 30 knot day "excitement" to a 10 knot day. Not a bad thing if you ask me! If you want to cut down on the big crashes, you can tune your gear to be a bit more back foot heavy. It's easier to control the splash down from your back foot than your front. In the video below, I was sailing the Slingshot with the wings in the forward position, and it was incredibly front foot heavy, especially when I started to get powered up. You can see that I went head over heels with a completely submerged nose when I foiled out. Next time that I try that rig I'll switch the fuselage around and try to get the whole rig to be a bit more back foot biased. Should make a world of difference... but we'll see! Great informed commentary by you and the others. Just wanted to point out that in your video, at 0:44, one can see something large and white in the center of your big foil just before you crash. Wonder if that's your foil ventilating, perhaps due to the streamline working its way down the vertical mast to the horizontal foil? Perhaps you might want to point your camera downwards more and analyze this phenomena more closely. Thanks for the great discussion, all. Wind-NC, great point about back foot and front foot. I have always sailed back foot heavy, and most of my foil outs to front of the board raised up in the air instead of down, thereby preventing a catapult. Bert, can you tell us more about your experience foiling with the Kona CarbOne? Did you change out the Powerbox for a deep tuttle box? The Kona is very narrow compared to foil boards, how did that impact your foiling? Any information you can share would be great. I have a CarbOne and loved it but now foil always so if I could put a foil on it and get some fun with it that way I am very interested. [quote="brynkaufman2"]Bert, can you tell us more about your experience foiling with the Kona CarbOne? I foiled the Kona on a whim. Did it 3 times at different spots here in the San Francisco Bay area this summer. I used the powerbox adapter made by Windance and have used on my 110L RRD Firemove (75 cm wide), and a 101L RRD slalom board (62 cm wide). The adapter worked fine on these boards and allowed me the chance to experiment with different board widths and lengths to get a feel for what types of boards I felt comfortable with once I started foiling. The Firemove feels great on the foil. The CarbOne was real stable on the foil and ,while taking a bit longer to get up, was a nice steady ride. Foil jibing the longboard is a whole lot easier than when it's on the water.., that's for sure! The large flange on the powerbox adapter offers some protection against the stresses placed on the finbox but probably only to a point. Realizing this I bought the JP 135 (85 cm wide) foil board and am using that exclusively. Also have a JP SLW (92cm) which I use with big sails. Thanks Bert, it is amazing the range of boards that can be foiled. Your statement backs up my theory that the larger the board the more stable it is, as long as it is not too large to go up on the foil. 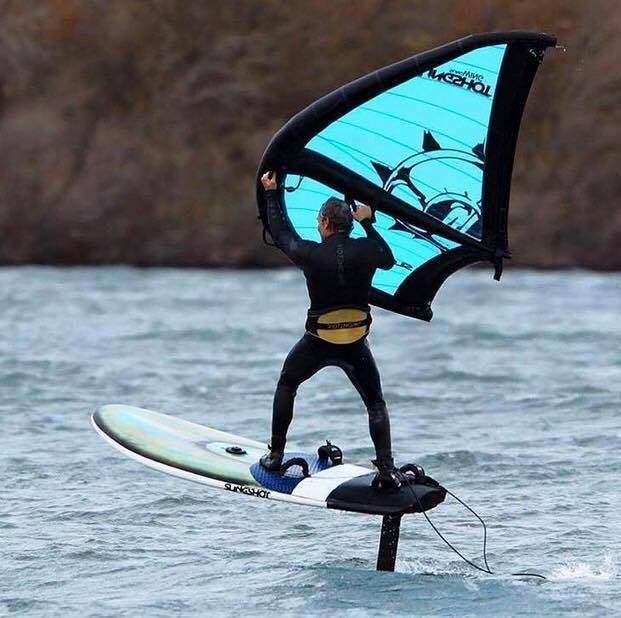 This was always true for regular boards on the water, and it seems to be true too for foil boards in the air.